Join Grace Gufler and Sarah Silva, two counselors living in Chicago, discuss a variety of psychological and counseling topics we wish people knew about. On this podcast we will discuss mental health stigma, what therapy is like, and other mental health topics and techniques. Stay tuned towards the end of each episode for a weekly challenge to incorporate into your self-care routine. This week Grace and Sarah talk about how you can celebrate yourself this Valentine's Day! Stay tuned as they talk about various ways to celebrate you this week! If you’d like to learn more, check out our website at www.acceptingtherapy.com. This week Grace and Sarah talk about what it takes to really love yourself. From putting yourself first, to advocating for yourself, loving yourself takes a lot of personal growth and self-compassion. Stay tuned as they talk about what it takes! If you’d like to learn more, check out our website at www.acceptingtherapy.com. This week Grace & Sarah discuss ways to set goals for the new year using SMART goals. Recent studies are also discussed throughout as well as tips on how to set goals that you can attain. What I wish people knew...about making your new year's resolution stick! In this week's podcast, Grace & Sarah will discuss some helpful ideas based on a different approach to setting New Year’s resolutions. Stay tuned to find out what this approach is! If you'd like to learn more about us, you can reach us at info@acceptingtherapy.com or at www.acceptingtherapy.com. On today's episode, Grace and Sarah discuss the not so good consequences that result from physical discipline or spanking children. Stay tuned to hear about other methods that are more effective than spanking. To learn more about parenting, contact one of our therapists at www.acceptingtherapy.com or at 312-373-0782. Join Grace & Sarah as they discuss the holiday blues. Stay tuned to hear about some things you can do to help you fight the winter blues! If you'd like more information, contact us at www.acceptingtherapy.com or at 312-373-0782. This week, Grace & Sarah dive deep into providing some alternative ways to cope with ADD/ADHD symptoms. Stay tuned for some practical ways to cope with ADD/ADHD symptoms. On this week's episode Grace & Sarah tackle some ideas related to what perfectionism is really all about. Perfectionism is a great topic to discuss with your therapist. If you'd like to learn more about perfectionism, check out our blog posts on www.acceptingtherapy.com on identifying perfectionistic tendencies as well as 5 tips on overcoming perfectionist tendencies. This week we have a special guest, Vicky. Vicky Ayala is a brand strategist and visual storyteller who helps multi-passionate entrepreneurs identify their signature hook and monetize their bankable skills. She integrates mysticism with the entrepreneurial journey as a way to make the road to success fun, inspiring, and engaging. She creates products to help women navigate self-mastery as way to differentiate themselves in the online space. It is through this work that she’s also able to manage her own experiences with depression and anxiety. Welcome to this week's episode on how to spot the red flags of domestic violence. Join Grace & Sarah as they discuss different patterns of behavior that may be apparent in an abusive relationship. They also touch on how subtle these signs can be within a relationship & demonstrate it through applying it to a fictional case. This week, we bring in a special guest to talk about the myths related to eating disorders. Sheana Tobey is a staff therapist at The Awakening Center, located in Lakeview Chicago. She works with adult individuals who are struggling with eating disorders, trauma histories, and anxiety. She is also a co-leader of the yoga informed psychotherapy group at The Awakening Center. For more information, please visit her website www.sheanatobey.com. Oops! We forgot to post this last week! Join Grace & Sarah as they discuss what generalized anxiety disorder is as well as common ways to treat it. Stay tuned towards the end for our weekly self-care challenge! Join Grace & Sarah as they discuss some important reasons to have self confidence and what you can do to build it! Stay tuned towards the end of the episode for this week's self-care challenge. Join Grace & Sarah discuss the differences between the term depression and the clinical term of major depression. Stay tuned towards the end for our weekly self-care challenge!! In this episode, Grace and Sarah discuss several ways anxiety is known to trick your thinking! Want to learn more? Tune in to find out. Towards the end of this episode, a weekly self-care challenge is discussed! This week, Grace & Sarah discuss what people should know about postpartum depression. Risk factors, signs & symptoms, as well as what measures one should take if they are experiencing postpartum depression are discussed. Stay tuned towards the end of the episode for this week's self-care challenge. Today, we welcome Sarah Buino. Sarah is a Licensed Clinical Social Worker (LCSW), Certified Alcohol and Drug Counselor (CADC), and a Certified Daring Way Facilitator (CDWF). Sarah is the founder of Head/Heart Therapy, Inc. Head/Heart Therapy is a group therapy practice specializing in the treatment of adults and adolescents struggling with shame, addiction, mood/anxiety disorders, and many other difficulties of life. We are honored to have Sarah share some of her expertise on the topic of shame. Stay tuned towards the end of the episode for our weekly self-care challenge! 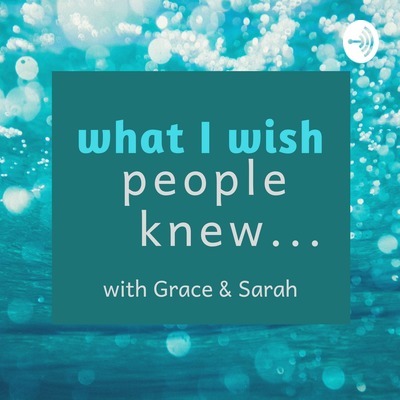 Join Grace & Sarah as they discuss what they wish people knew about stress! Stay tuned towards the end of this episode for our weekly self-care challenge! Join Grace & Sarah interview a special guest this week: Dr. Patrick Corrigan. Dr. Corrigan is a professor of psychology at the Illinois Institute of Technology and licensed clinical psychologist. He is a renowned researcher in the field of mental health; particularly on the topic of stigma. Dr. Corrigan has been the author of 10 books, over 300 papers and a contributor to The Honest, Open, Proud program. Stay tuned towards the end of this episode for a weekly self-care challenge! Join Grace & Sarah as they discuss panic attacks. Common signs and ways to cope with panic attacks are discussed. Stay tuned towards the end for the weekly self-care challenge. Join Grace & Sarah as they discuss what to expect during your first session with a therapist. Stay tuned towards the end for the weekly self-care challenge. On this episode, Sarah and Grace talk about mental health stigma. We discuss how to identify it as well as ways to advocate to decrease stigma surrounding mental health. Stay tuned towards the end for a self-care challenge of the week! Tune in as Sarah Silva and Grace Gufler discuss the importance of choosing a therapy modality that works best for YOU! On this episode, Cognitive Behavioral Therapy, Acceptance and Commitment Therapy, and Positive Psychology are discussed. Looking for our self-care challenge? This week's challenge is towards the end of this episode! Tune in to this episode where Grace & Sarah discuss what they wish people knew about the importance of self-care. Both Grace & Sarah discuss what's important for them as counselors to include into their self-care routines!